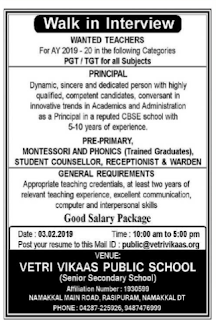 Rasipuram,Namakkal as advertised for the recruitment of Teaching Faculty- Principal,KG,PGT,PRT,TGT jobs vacancies. Interested and eligible job aspirants are requested to attend interview on 3rd February 2019.Check out further more details below. About School:The school is affiliated to the CBSE (Central Board of Secondary Education). Various details about the school are listed below - contact information, academic facilities and other publicly available information from the CBSE portal. The Affiliation Code is 1930599 . Appropriate teaching credentials,at least two years of experience,excellent communication,computer and interpersonal skills. 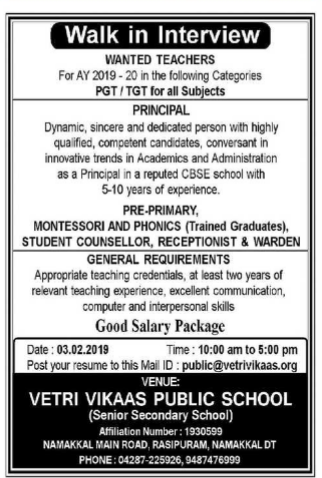 Principal: As a principal in a reputed CBSE school with 3-5 years of experience. How to Apply: Send your resumes with passport size photos to mail.